Our friend Katy was flying in from Melbourne for a visit over Easter so booked into a caravan park in Denham. Fortunately there was enough space to set up our camper trailer as normal plus the two-man tent we carry for times when we can’t take the trailer with us, so she had her own guest quarters! The airport is only ten minutes from town so it didn’t take us long to get settled in and head to the pub. 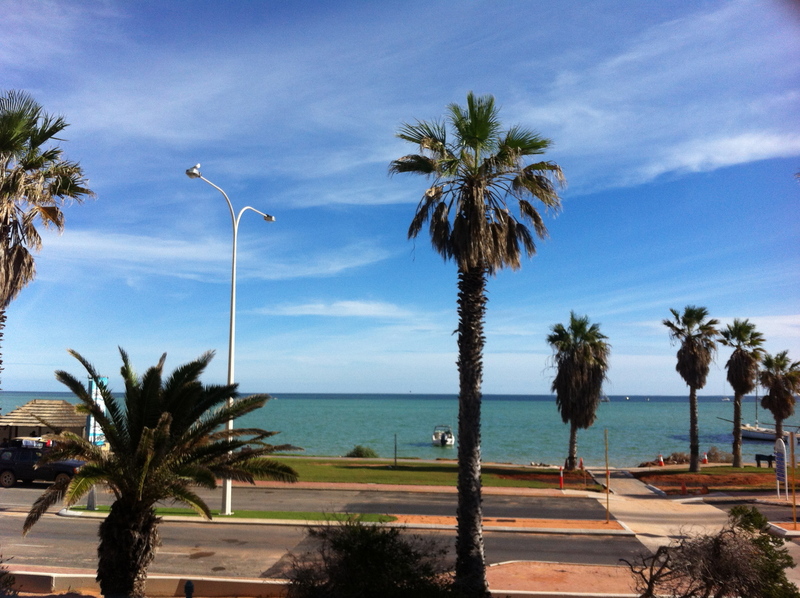 We chose the Waterfront Heritage Hotel as they have a fabulous balcony that overlooks the ocean. We settled in and enjoyed catching up over drinks. Unfortunately the service wasn’t anywhere near as good as the view and we were left waiting for 40minutes before the disappointing dry tasteless food finally turned up. Francois Peron NP used to be a sheep station. Located at the end of a peninsula, feral animals are now being eradicated under project Eden. This is allowing the native wildlife to return and thrive. The old homestead now houses a museum display on sheep farming. 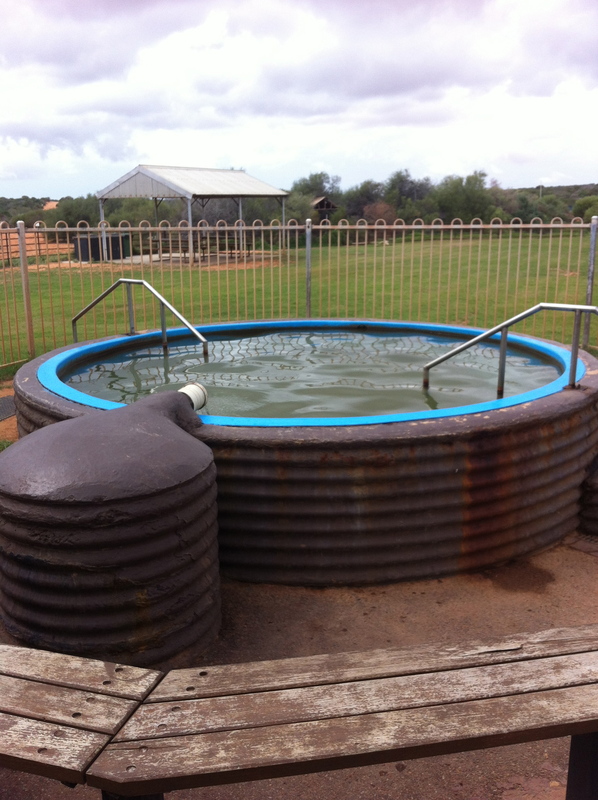 There is a natural heated spring that feeds a spa that can be used for free (well it’s covered in the cost of the park entrance fee). Most of the tracks in Francois Peron NP were closed due to damaged caused by that pesky cyclone Olwyn but we were able to visit Big Lagoon. After lowering the tyre pressure we followed the relatively short track in. There were a few campers here, but there edge of the lagoon was rocky and no conducive to swimming so we left it to the fishermen and headed back to the homestead. Not far out of Denham is Little Lagoon. This is a large super-salty shallow lagoon. 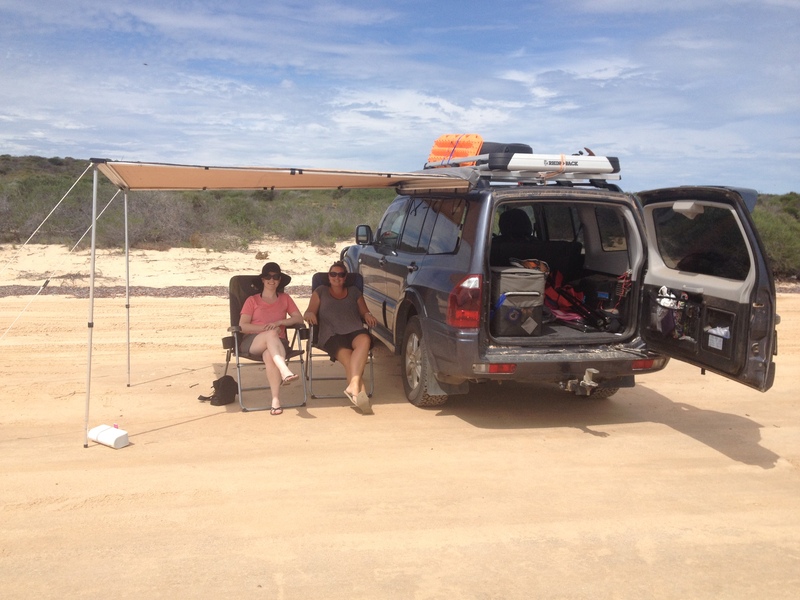 We drove the car down onto the beach and relaxed for a morning alternately paddling or reading. 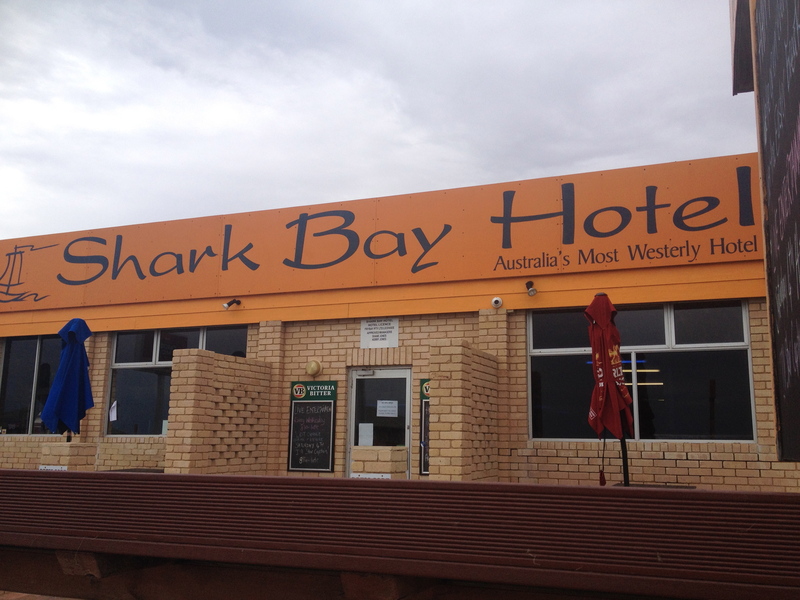 Australia’s most westerly pub. A great bar, this is definitely the locals pick. The walls lined with drawings of local fishermen. We stopped in for a couple of drinks twice. Once during the day for a quick drink to get out of a short rain shower. The second time was after dinner. Things started well and we were enjoying the music selections of the juke box, before karaoke kicked off. We stayed and watched as people as they walked out, but after a couple holiday makers screeching away we left too. 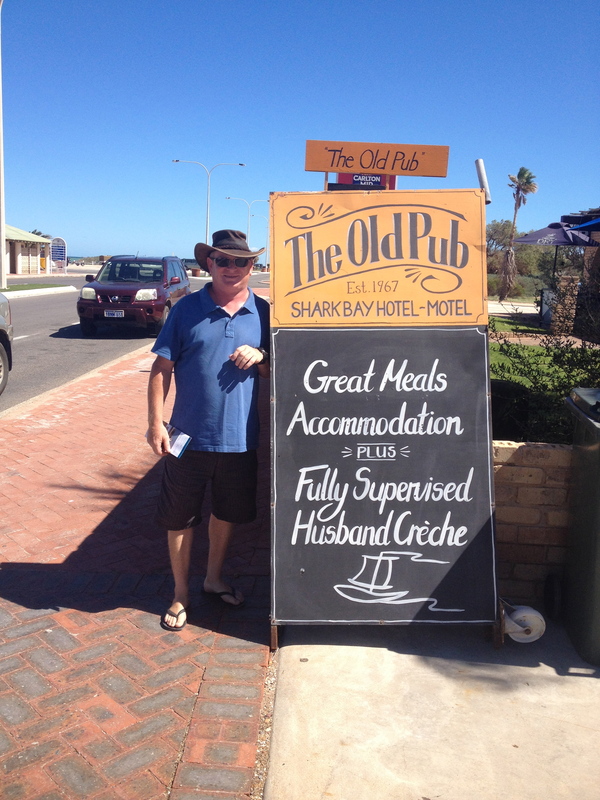 For Katy’s last night with us we booked in at the Old Pearler Restaurant. Constructed of bricks made of compressed shells from shell beach the building is small and unique. We had a wonderful night here and can verify that it’s reputation as the best place to eat in town is well earned. The food was delicious and we all enjoyed every morsel. The homemade honeycomb desert was to die for! Alas the week went all too fast and we soon found ourselves back at the airport waving farewell to Katy. Wow, the view from the waterfront balcony looks absolutely amazing!